Halligan will be heading to Brazil for St Patrick’s Day. JUNIOR MINISTER JOHN Halligan has expressed his strong opposition to Enda Kenny meeting US president Donald Trump next week for the annual St Patrick’s Day greeting in the White House. Speaking this afternoon on RTÉ’s Saturday with Claire Byrne, Halligan said he did not agree with Kenny meeting Trump next week, labelling Trump a “sexual predator”. “I can understand why the Taoiseach wants to go [but] I don’t think he should have gone,” said Halligan. He took aim at Trump over a number of issues, criticising the US president’s comments over women and the press. “I think we’re dealing with an individual [who] promotes division and hatred,” said Halligan. “He’s actually hostile to the free press, he’s a misogynist, he’s a liar, he’s a sexual predator. As a matter of fact where he boasted about how he can sexually assault women: Why would we deal with someone like that? Halligan said he and Transport and Sport Minister Shane Ross are the only two ministers who objected to Kenny’s meeting with Trump. We speak our mind and we did bring it up at Cabinet. But we were the only two ministers that opposed him going and we did make it quite clear for the very reasons that I’ve given you. Halligan said the Government had good connections in both the Republican and Democrat parties, and that Kenny could travel to the US without meeting Trump. The junior minister for training and skills is travelling to Brazil for St Patrick’s Day, while Ross is staying in Ireland. “I didn’t necessarily think that we needed to meet this guy,” he said. I particularly would not meet him and would refuse to meet him. Email “'He's a sexual predator': John Halligan is not happy with Kenny meeting Trump”. 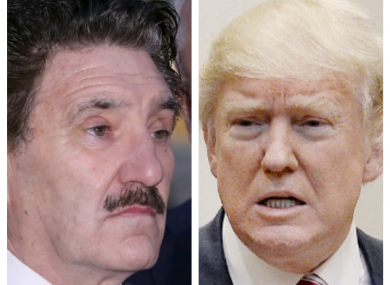 Feedback on “'He's a sexual predator': John Halligan is not happy with Kenny meeting Trump”.